How are you all doing on this fine, freezing cold, 97th day of January…?! It sure is the longest month, E.V.E.R. And yet… we are almost there guys. I’ve decided to do a top to tail, 100% Toppers edit today. When you’re just 5ft small with the build of a pre-pubescent teen (…yep, I can in theory fit kids clothing, size Age 11-12,) good old Topshop and their stingy sizing comes up trumps for me, time and time again. I can’t afford to be snobby about it. I mean… I know that living in a small town, at my age, with my lifestyle, it’s all about Boden, White Stuff and Fat Face for a great many who are in a similar boat to me. But for the most part, most of the brands directed at ‘my age bracket’ have clothing styles which aren’t me. And sizing that’s too generous. But good old Topshop and I… well that’s one true love. Starting safe with a simple, black midi dress. 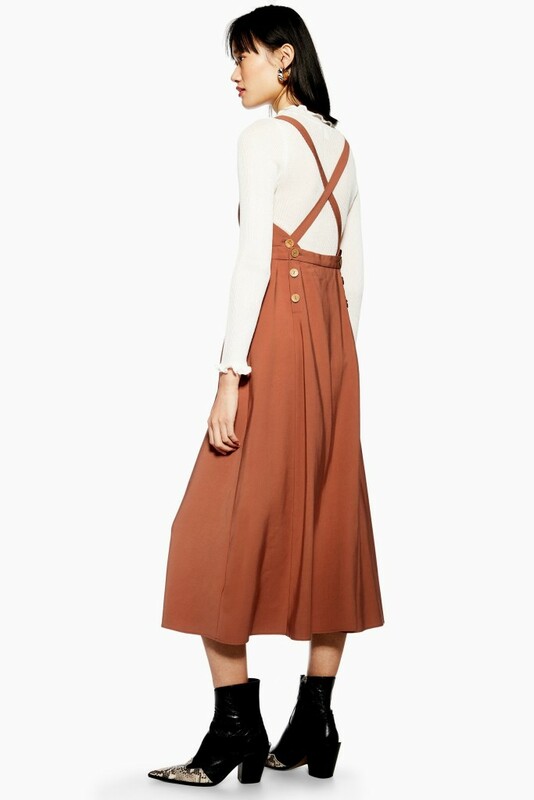 I’ve always loved a Pinafore style, but often, they seem to only be available in a knee-length or shorter style. This longer midi cut is a little more up my street. It’s a lovely style for layering long-sleeve skinny knits under; chucking a chunky cardi over and lends itself well to being worn with boots or trainers. And indeed sandals & short sleeve tees. My reservation (based on being as short as I am) are that there looks to be quite a bit of fabric at the back of the dress, which would easily swamp a petite frame; the dress is only available in the regular range (no Tall or Petite versions just yet) so for any shorties wanting to buy the dress, you’d need to take it up. In addition to the too much fabric/too much length, the dress is made of predominantly viscose but with 8% polyester which, appears to give the fabric that slightly ‘cheap’ sheen, from the look of the Toffee coloured version of the dress. Guess there’s only one real way to find out, but for now, I’m being good*. I missed out on the faux-fur version of this bag before Christmas, partly because I was too stingy to pay the full £25 tag for it, and also because I was suppressing the urge to buy items that I felt were passing, faddy, flights of fancy. Doing my teeny-tiny bit towards saving our planet from the destructive force of fast-fashion. Instead, sharing my ‘wanting’ this bag on the blog might help temper that ‘want’ feeling…?! 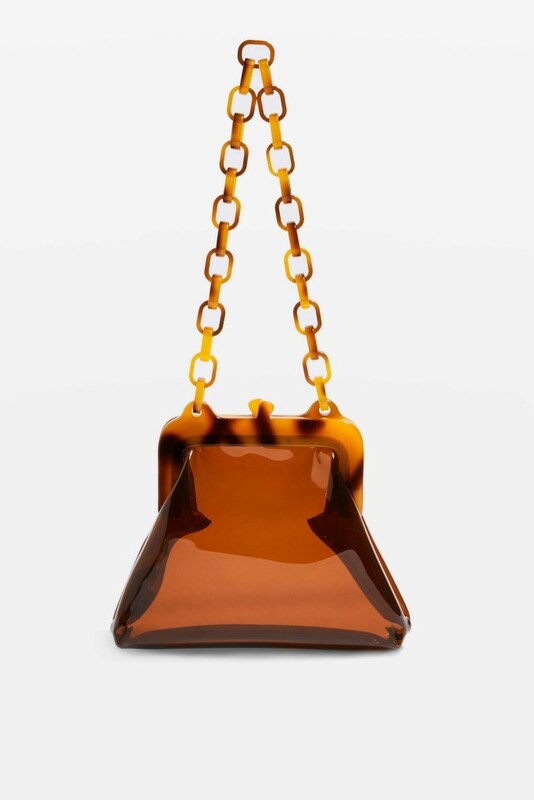 Do I really want an actual see-through bag?! It’s such a lovely shape & size tho. 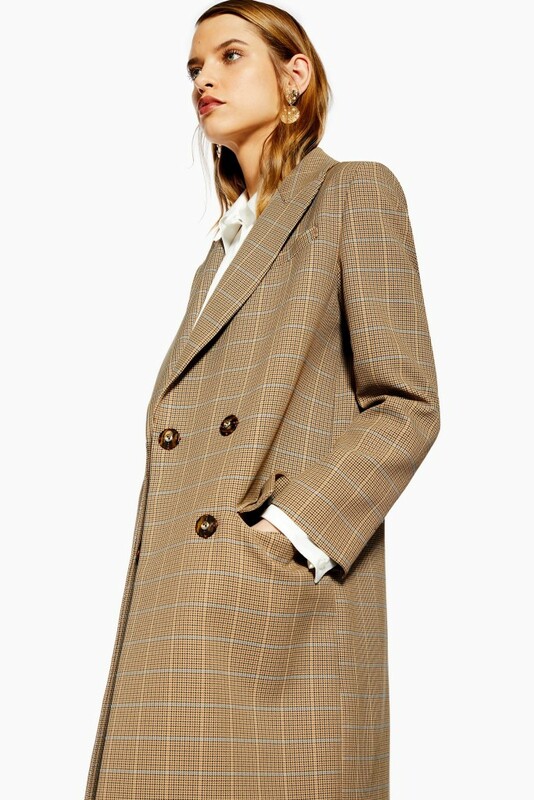 I am totally loving this longer line blazer (aka “a coat!”) suited look. I specifically went into Topshop Oxford Circus whilst in London last weekend, just to check this suit out (no pun intended) in the flesh. And it really is rather lovely. Good value too, given the fabric/check looks more expensive than the price tag. 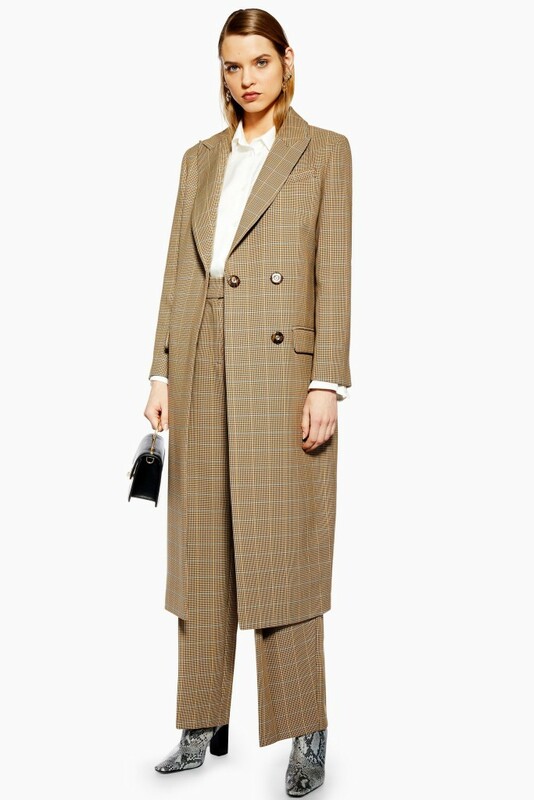 You can buy the items as separates with the Coat coming in at a reasonable £85 and the Trousers at £46. Unfortunately, the proportions of the coat were too long for me, and indeed, I’d say, a bit off for anyone 5’2″ and under. But to be honest, I don’t think I could pull both pieces of this co-ord off, not when worn together… I’m just too short. And besides which, it was the trousers I was most interested in, and already had my bank-card in hand, fully hoping to purchase them. There were no size 4s. … I have old Toppers items in my wardrobe dating back almost 20 years and they are all size 6. I can only assume that Toppers have ‘done an H&M’ and whether you call it vanity sizing or merely correcting sizing or something else, it appears I’m not a 6 anymore. Back to the trousers, I did try the size 6 but they were far too generous on me, and although I immediately checked online whilst still in store, there were still no size 4s. Not sure if the suit was ever available in a size 4 on this occasion? Here’s hoping a petite version of the trousers come out soon. 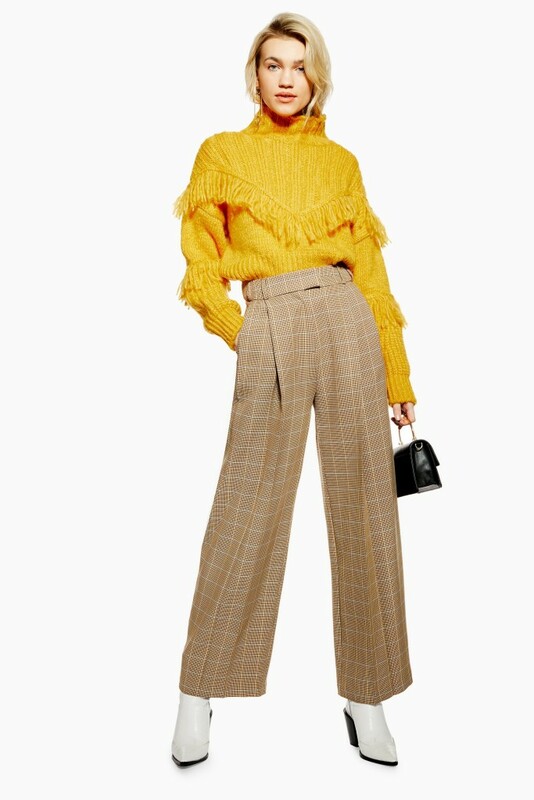 I also tried these trousers on – which, again, I didn’t take a pic of because frankly, after wandering around Oxford and Regent Street for a couple of hours, I was just too hot and bothered to pull my phone put and pap myself. 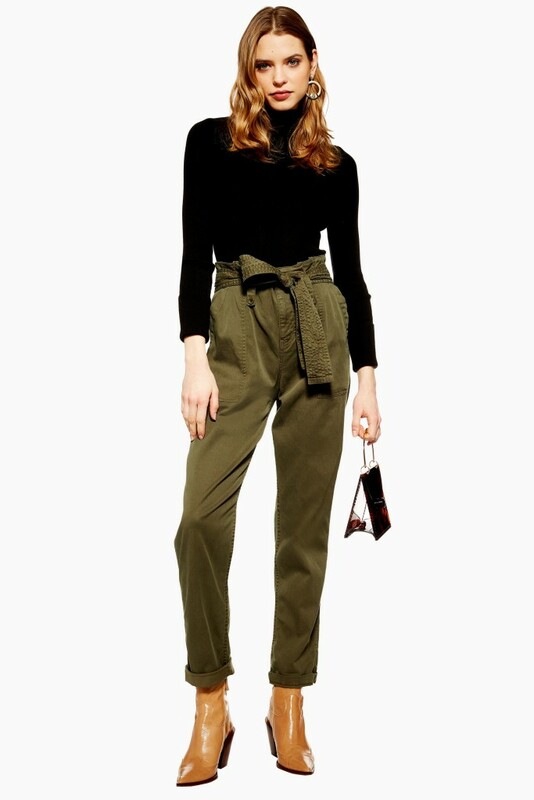 The trousers are lovely and soft: there’s lyocell in the fabric mix which means they won’t crease as much as cotton and are as comfy as joggers. The trousers were of course a bit too long on me, but another double turn-up of the hem was all it took to make them the right length. I didn’t buy them but they are currently in my basket. Again, another one I saw in-store and another one I quite liked and it’s also available in Petites. … so with that in mind, it’d be a waste of money for me. 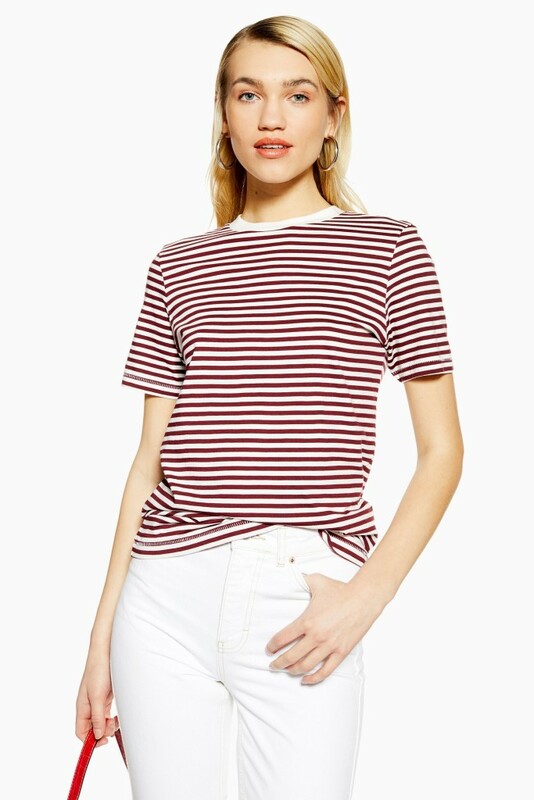 But given I’m not big on florals, or animal print… this stripe pattern is definitely one I could do. I’d probably style it with a more muted colour of knit or hoodie: greys, navy, black, browns… but I think a bright red hoodie would also work a treat. 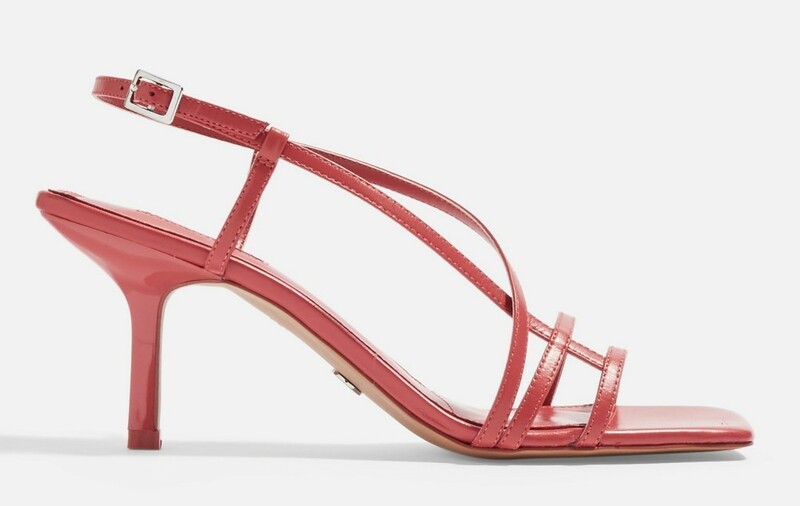 You all know I can’t really wear heels, but that doesn’t mean I can’t coo after them, nor think about perhaps buying them as I imagine myself with perfectly functioning, non (near) arthritic knees! 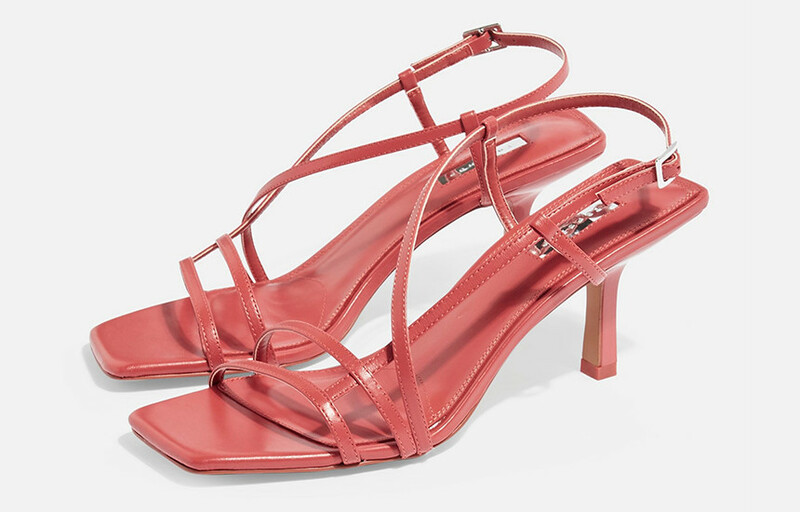 As far as strappy, heeled sandals go: these are perfect in my eyes. How effortlessly cool would they look with ankle grazing, faded blue jeans and a simple white boyfriend tee in the summer? Sizes 37 & 38 are already sold out online, although I am sure you could probably pick a pair up in store. So… they look super high in this pic, don’t they? Apparently it’s just a 2″ heel. I’m irrationally smitten with them. Wondering if I should just buy and put on display on some shelves at home – pretty sure I’d get more than a little joy from just looking at a pair of beautiful heels…?! Oh and please note the colour: Living Coral… Pantone’s colour of the year… perfect for any Summer sunshine…? I love this style of top, but why crop it Toppers, whyyyyyyy? Well, the obvious answer is, of course, that this top is targeted for their teen clientele and not a 47 year old bat like me. But I really liked the colour and I love a polo top. Just not a cropped polo top. How lovely is this skirt? Too long for me, obvs, but I’m pretty certain a petite version of this style will be issued soon. Why is it my wildcard? Well, it’s a wrap skirt for starters. 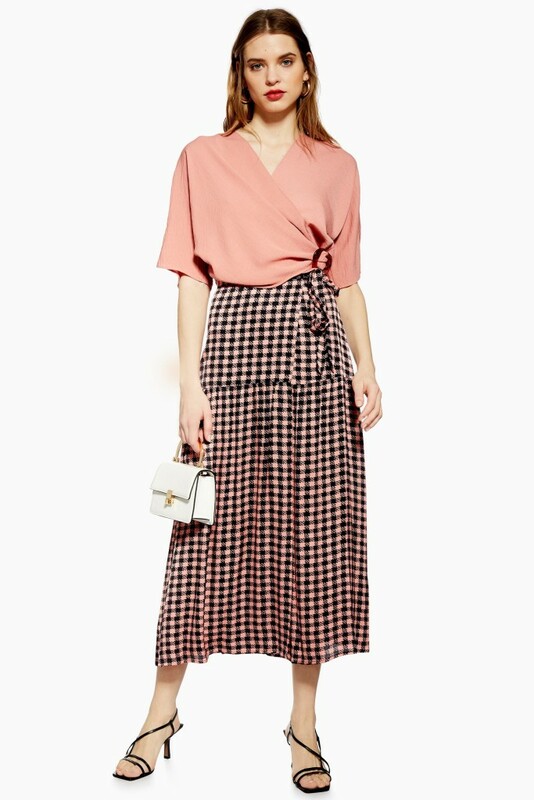 And quite a bold check print. … that seam would come too low on a short arse like me, so the skirt would require a more involved alteration than I’d be willing to make time or money for. Still, it’s rather gorgeous isn’t it? As the name of this look suggests, just add a hoodie and heels. And maybe some sparkly socks too? This Relaxed Hoodie (£25) should you not already have similar in your wardrobe already is a great, baggy, slouchy fit which I would wear loose (no half tuck) over the skirt. C O N T R A V E R S I A L…? But, once you’ve added your Slinky Ribbed Socks (£3.50) and your coral Rome Heeled Sandals (£46) you have a perfect outfit of opposites which (in my view) just works. But I just can’t find it to link to, online… not sure if it’s sold out online already, or just not available yet. Who doesn’t love a bit of matchy-matchy every now and then? 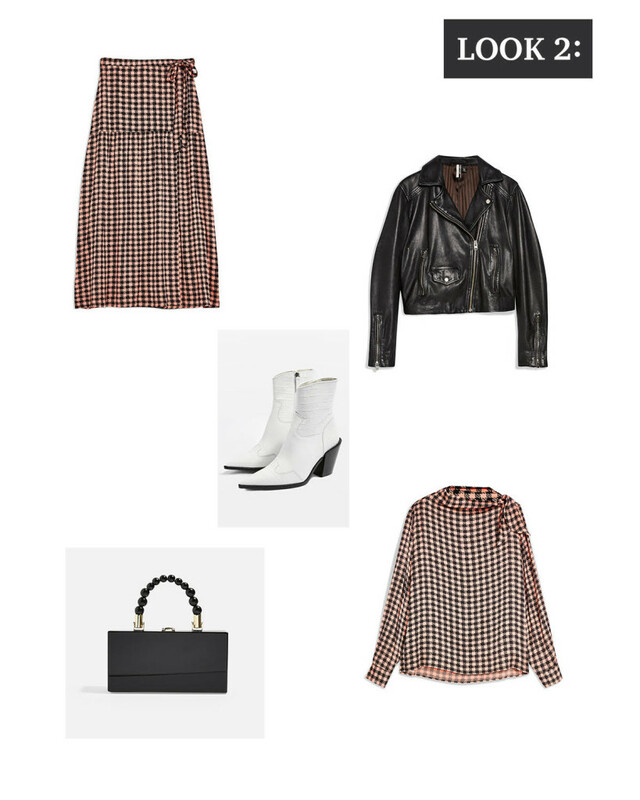 Most of us have white boots of some description in our wardrobes, and I think this matching co-ord outfit would look fab with a pair. I’ve popped these Howdie High Ankle Boots (£89) as an example. And conversely, you could just clash things up to the max! Starting from the feet up this time, with these (smaller, delicate) Leopard Print Converse Hi’s (£64.99), and this blue Animal Utility Shirt (£35) tucked in, of course. And at the final hurdle, my print clash look is going to have to crash and burn: I simply could *not* add any further animal print… my eyes were in danger of bleeding. I know the general consensus on Instagram is that there can never be too much animal print or colour clashing going on, but in my view: there can. And finally, this pink Claire Tortoise Shell Clutch Bag (£20) carried either by it’s handles or folded over into a clutch. … I was just seeing if I could push myself out of my comfort zone! So that’s it for this week: what are we thinking? And before I go, could I ask for a spot of help? So… just wondering if anyone’s seen it in store? Or was it a before-xmas piece which I’ve missed the boat on? If you know – please leave a comment and put me out of my misery?! Thanks for reading – as always, I love to hear from you here on the blog, so leave a comment and I’ll get back to you. 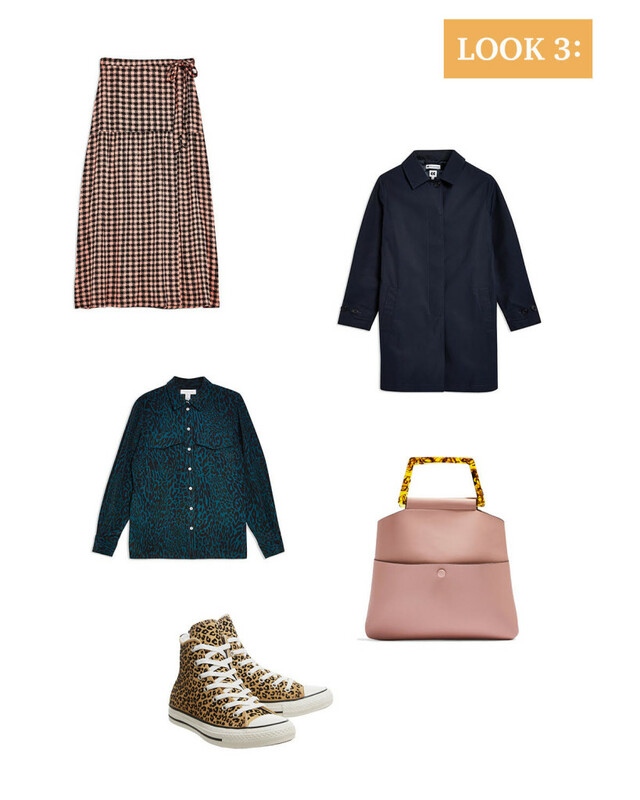 Same here – it’s too cold for skirts and my bias cut ones are also languishing in the wardrobe. And I hear snow is forecasted tomorrow around our parts! But like you, I’m starting to look at the new in – roll on warm weather for cropped pants and bare ankles. I also think if anyone was to carry off that midi pinafore – it would be you! Hey Sue! Thanks for popping over! I’m hoping the weather will pick up soon so we can free the legs a little… I don’t know how others wear dresses daily at this time of year! I love the pini dress… but I have a similar looking pair of dungers. 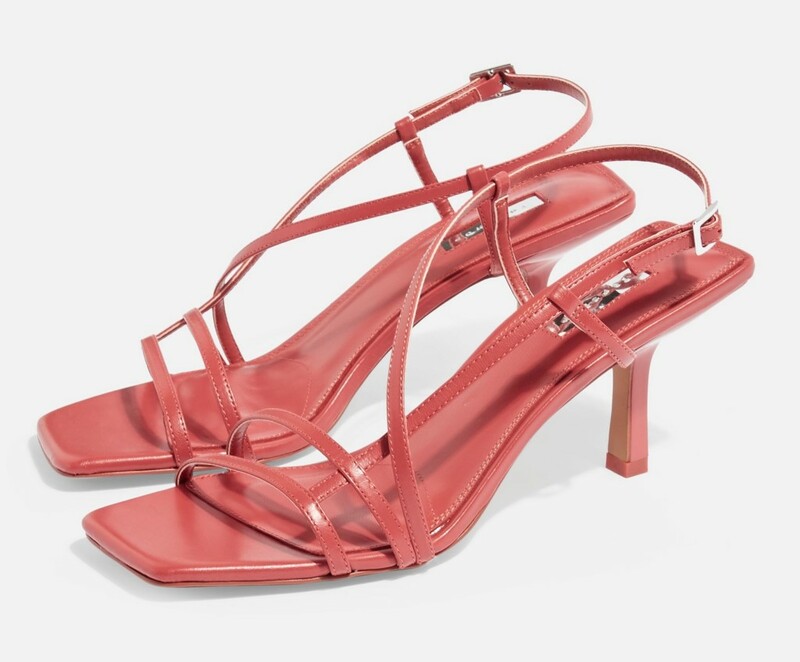 I bought the Topshop sandals after seeing them on here, and love them. There was a very similar looking sandal in Feb Vogue for £650! Hope they’re as lovely in the flesh!